Aaah !! Don't envy that you are not able to have a blackberry now.Now you can convert your regular cell phone or smartphone into a Blackberry like push mail devices for free.Yesterday I received a mail about this product.Now when I checked its features and all ,I thought its something useful for my readers. What am I talking about ?? Consilient ,(former partner of RIM) today entered the Indian market with their free push e-mail service that will bring your GMail, Yahoo Mail, Hotmail or any other POP3 / IMAP mail right on your cell phone screen.You can also send and receive photos using this service.You can even read attachments in your phone like MS word and PDF. 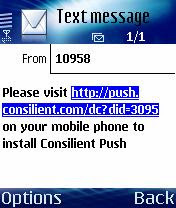 With Consilient Push, you don't need an expensive new device or phone for mobile email. All you need is your regular mobile phone and a data plan from your mobile operator. 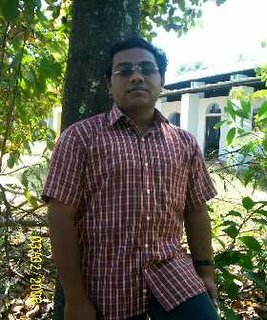 Set your favorite MP3 for new email notification or choose your own personal picture as a backdrop for your email accounts. Create your own email signature. Also if the unthinkable happens and you lose your phone, you can lock it down and keep your email from being read. Any data network like Airtel, Reliance, BSNL, Hutch, IDEA and Tata Mobile. So what you have to do ?? In brief,All you have to do is to supply your mobile phone number on the Consilient website. They'll send you a confirmation SMS with a link as shown in the fig to download a small application from your mobile phone browser.Do it and you are done.